ROBERTA: So last week we got a peek at Jan's amazing Christmas tree and that got me thinking it would be fun to see everyone's decorations. Or if you don't decorate, you could tell us how you feel about that! About eight years ago, a little cedar seeded itself next to our light post by the front walk. Over the past couple years it totally shot up and began to take over the post. John and I both agreed it had to come down, and then we had the bright idea of cutting it down to use as our Christmas tree this year. Of course, we've never trimmed the thing and it's lopsided because of the way the wind has whipped it around for eight years. And now it's even more lopsided because we had to trim a huge section in order to be able to watch TV. And it gives off a funny little odor, not that nice pine scent we're used to. (My sister thinks it's a specimen called a "stinking cedar". Really.) After seeing Jan's tree, this is just a little embarrassing. There's the before photo with my woodsman at the ready. and then here's the after--definitely got the Charlie Brown thing going. And PS, we decided to try a string of those low wattage, new-fangled bulbs this year. I kept thinking they couldn't really look blue...but they do. They are NOT growing on me. What's up in your house this year? Hank: Think we could have a Christmas tree this year? Hank: Yeah, but we had one growing up. For a while. Until my mother decided to remember we were Jewish. But that was years later. And trees are so pretty! And festive. And they smell good. Hank: We could have just a little one. With all red satin bows and candy canes. Come on. Hank: Yeah, I know. So how about one of those rosemary trees? You could just think of it as an herb garden. With red bows and candy canes on it. As you can hear, this is a discussion in progress. ROBERTA: Hank, I bet he knows by now that no discussion with you is ever quite finished:). HALLIE: I usually put a green swag on the front door, and that's that. But our neighbors make up for us. Across the street there's lights everywhere and a goose on the front step dressed up like Santa. A few years ago they added a bowing blow up snowman which fortunately seems to have bitten the dust. Next door tasteful lights front, back and sides. We have lovely neighbors and it's all very jolly, though I am grateful no one has a soundtrack going. Hanuka was so early this year it got away before I could even make potato pancakes. ROSEMARY: I'm suffering from Christmas tree withdrawal. We're leaving for Rome on Dec 23 and it didn't make sense to put up a tree that we'd have to either take down before we went away or not get to enjoy for very long once we get back. (I did leave my tree up until February once but that's a long story.) I have white minilights on the fireplace and on a credenza all year long so this year I just added a few strands. Also bought swags and tied ribbons around them. And ...uh..baskets of pine cones. Ten dollars says I get a small tree in the next few days. Here's a pic of last year's tree. RHYS: I've just finished the enormous task of decorating the Christmas tree with one hand. Last year we gave in and bought an artificial tree for the first time. And I have to say that it looks gorgeous. But it doesn't smell. I'd even trade Roberta's stinky smelling cedar for it. One of the things I love about Christmas, is that outdoorsy pine smell. However, I just found out that Trader Joe's has all kinds of pine wreaths. So one of those over the mantelpiece, ought to make the room smells sufficiently Christmassy. And here is my photo of the dreaded artificial tree. JAN: We live next door to a neighbor with unlimited resources who hires -- well I can only call him/her/it a professional Christmas light artist. The lights are massive, all in white, but every tree, every window, every gutter, and angle. And she's got some sort of full-size Nutcrackers at the door, and full-size Christmas people on the porch. People come from all over to see it. But without the professional contractor, we do all right. This year my husband was inspired (maybe by next door) and put green lights on all the base/trunk of the trees and white lights on top. White on the bushes, its very pretty. I bought the wreath for the door, but it actually has to be hung from the window above the door, so it isn't up yet. But you've all seen the tree -- my daughter also decorated the foyer, the family room, and the dining room. We even have reindeer towels in the bathroom. ROBERTA: Hallie, I'm crazy about that goose. Ro and Rhys, your trees are lovely. Jan, I'm glad it's not a competition, our houses against yours! Jungle Red Readers, what's up in your house this year? I don't have a tree (yet) and I don't even have the excuse of being Jewish, Hank. I do a big Thanksgiving and decorate the house because my mother-in-law visits every year, so we do the whoop-de-do for her. I have a collection of turkey items. Christmas is always quiet. Someone else usually gets a tree. It will probably happen today. Me, I'd be happy stringing lights on the ficus. However, now I want reindeer towels for my bathroom. Hallie,why is the goose chained to the gate? Our main Christmas tree is an Around the World tree. I decorate the tree with ornaments from all over the world and flags from different countries. Family and friends love it. They know what to get me on their travels. I also have a new tree for my new library, so it only has two ornaments, a Skippyjon Jones cat and Lowly worm from the Richard Scarry books. I want to decorate the tree with ornaments that represent books and reading. Still a work in progress. 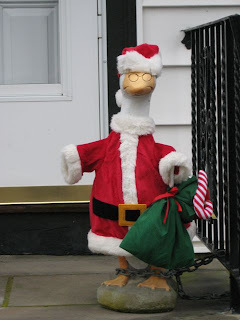 Oh, no, someone is holding Santa Goose hostage! Alert the authorities! When my oldest daughter (now 40, gaack!) was a month old we were given a small fake Christmas tree, a string or two of lights, and some ornaments, including one that looked like my redheaded baby girl. Over the years I collected additional ornaments, many of them with childhood themes: teddy bears, toys, Mother Goose characters. The theme of my Christmas tree was always "the wonder of childhood", and that redheaded baby, plus the two "first ornaments" for my other two daughters, were always the first ones on the tree. However, now my kids all come home for Thanksgiving, and for the last three years no one has been here for Christmas, and I just don't have the heart to do all that decorating just for me and Scrooge, er, my husband, who does not appreciate anything about this season (it's his one fault, shrug). So this year I bought a lovely spruce wreath from my favorite local garden store, and a poinsettia, and set out a tiny little already decorated tree that my father-in-law had when he was alive, and that's that. Yet someone it's enough. We went to a nearby Christmas tree farm and cut our own. Yesterday was tree decoration day (and cooking baking, too). We have more ornaments than the tree can hold, so we rotate. This year is primarily birds, fish and angels, with a new garland made a sea glass. I love the fragrance of the tree overlaid with the aroma of cookies. Truly intoxicating. I also love unpacking the ornament boxes. It's like greeting old friends. ANd whose goose is that anyway? Brenda..it IS like greeting old friends, and revisiting all the places you've been. I usually put my tree in the kitchen so I collect kitchen themed ornaments (among other things.) Next year, a REALLY big one to make up for this year. I love reading about the themed trees! We have no theme at all:). Not for the reindeers, about the reindeers. Each one is one of the reindeer, so I've got Cupid and Blitzen and Comet and of course, Rudolph. I don't usually go in for "Cute" but I sort of lost my mind on these. I LOVE that part of the tree!! Roberta got it in ONE. 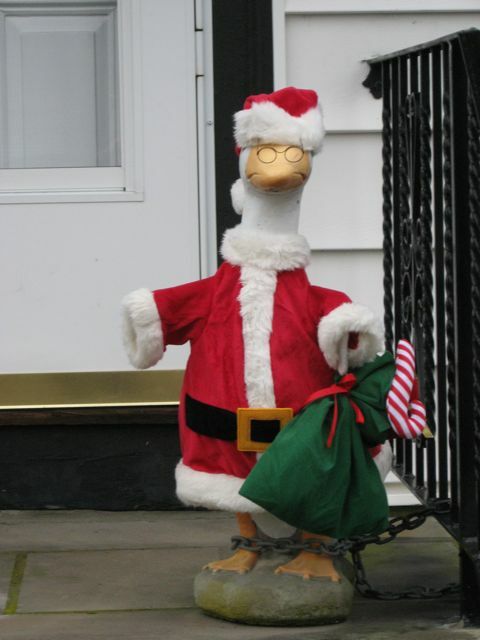 Yes, my across-the-street neighbor Jean has been dressing up a goose on her front steps for years and years. (First day of school, it sports a book bag.) Her first one got goose-napped so when she replaced it she chained the new one to the railing. It seems perfectly content. I'm revving up for baking mode, too - gingerbread cookies, hazelnut linzer cookies with raspberry jam, chocolate dipped orange rind. They'd make nice tree ornaments, if I had a tree. Instead, I think we'll eat them. I'd like to hear how you make a sea glass garland - sounds lovely. But with all the recycling, sea glass is harder and harder to come by. I too live with a Christmas-Scrooge and my sons didn't seem to be available this year to help decorate, but I did it anyway. Put on Ray Charles Christmas, pour a glass of wine, and hang up all the old favorites on the must-be-fresh tree. Like yours, Jan, we can't do without the misshapen felt gingerbread man from first grade or the little Red Sox hanging nutcracker. What we do love to hang on the glass door every year are the gleefully demented Santas and elves the kids made in the early grades. The expressions on these creations are very funny bordering on disturbing. I might need to laminate them before the paper falls apart! I had to freecycle the new LED lights I got last year. The light is clincally cold. Brr. Back to old hot pepper lights and hang the electricity bill. I’m not envying the reindeer towels, I’d rather have snowmen towels that can be used all winter. All your trees and tree stories are fun to read. Love the chained goose but not thrilled that some creap would steal a decoration besides being a crime, it's rude and inconsiderate. Since we gave our large fake tree to our daughter for her new house, we now have a small five-foot, skinny, fake tree so I do the theme thing due to owning too many ornaments. I’ve had a Pepe Le Pew tree, a travel tree, a cat tree, a lighthouse tree, a snowflake tree and an all white tree in the past. This year due to Scrooge—uh, I mean Hubby—and my having just had two eye surgeries a week apart, we are not putting up our tree. We are going to one son’s house on Christmas Eve and daughter’s house on Christmas Day so we will get to enjoy their trees. Our Christmas tree is a mish-mash of ornaments, starting with the ones my father-in-law's employer made for K-Mart, the official White House ornaments we get from friends in D.C., the construction paper with school photo ones from elementary school, and an assortment of cats, snowflakes, angels and moose. The moose are a joke on my husband, who is always trying to get good photos of them in Vermont. Last year, I got him a cute ornament of two moose in a sleeping bag (he hates camping), then realized both moose have antlers. Female moose don't.